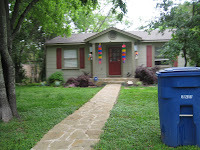 Adventures In Creating: Viva Fiesta! It's Fiesta Season here in San Antonio. 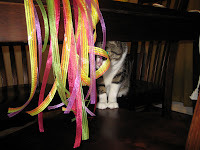 So that means Fiesta decorations! They are popping up all around our neighborhood. 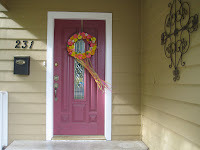 One of the main symbols of Fiesta is the Fiesta Wreath hung usually hung on the front door. Stores around here sell wreaths from $60- 80. 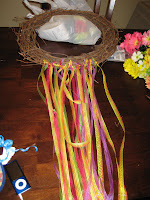 I thought I would make my own wreath to get into the Fiesta spirit and try to save some money along the way. 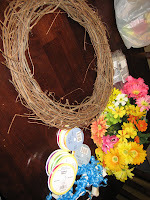 I bought a bunch the least expensive flowers, a wreath and some extra glue- about $30 worth of supplies and got to work. C.C. trying to help me out. Finished product! 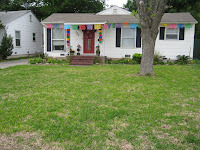 Yay- now we're ready for Fiesta! Cute! You are getting into the sprit of San Antonio.